Manned spaceflight is not a challenge forged from one molten idea - it's not a put-this-in get-that-out equation - it's not a sport for the isolationists. The notion that it was "one man's passion" or "one nation's resources" that got us to this engineering moment is simply false. And the idea that alienation could ever lead to exploration is impossible. There is likely no other industry or singular goal so intentional about teamwork - from employing teachers to technicians, soliciting standard to specialized natural resources, planning short term and long, investing in ideas and inspiration, training fresh-outs to experts, and communicating technically and politically. 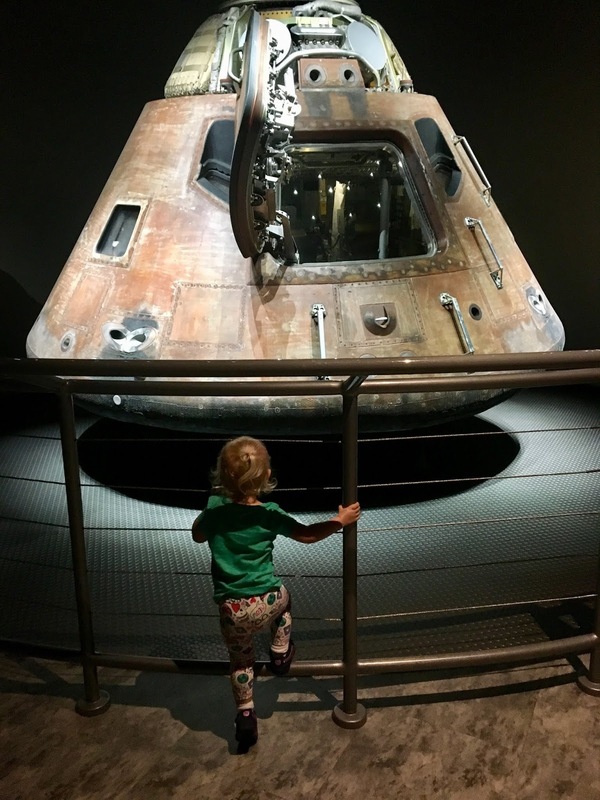 Tangibly, the manned spaceflight challenge crosses borders and age and gender, there are pieces of its presence spanning the entire globe, and beyond! One of those spots - notable for it's history as the last piece of Earth many astronauts touched before launch - is the Kennedy Space Center in Florida. Earlier this year we traveled there (as a family of three, shortly before Otto was born), tagging along as stowaways while Chris attended some meetings. After a day on the beach Zara and I were ready to see some rockets, and Chris was ready to be our tour guide as we traversed some of the less-traveled roads on Cape Canaveral. If you want to visit the space center but are strapped for time, it is probably best to skip the specialized tours and stick to the main museum and Saturn V center. We always swing by both when we go onsite, just to check on our surrogate rocket children. 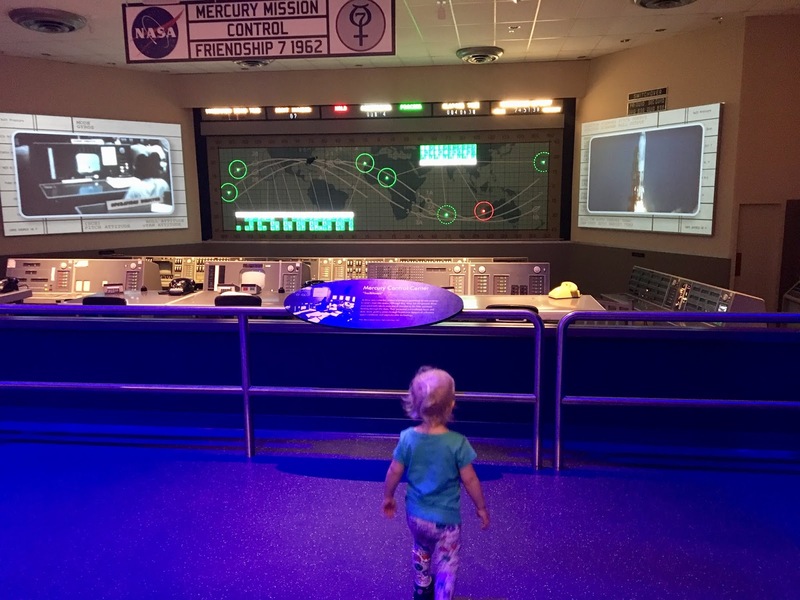 This time Zara was enthralled by the Apollo 14 capsule and the Mercury Mission Control setup. Proud mom moment as my little girl learns to dream big. If you have more time to spend it is definitely worth the time to take the Cape Canaveral Early Space Tour. This tour is fairly long but it allows you to see some of the launchpad remnants around the Cape. If you are a NASA employee, you can be your own tour guide (protip: use Google Earth) and spend as much time at the launchpads as you want! 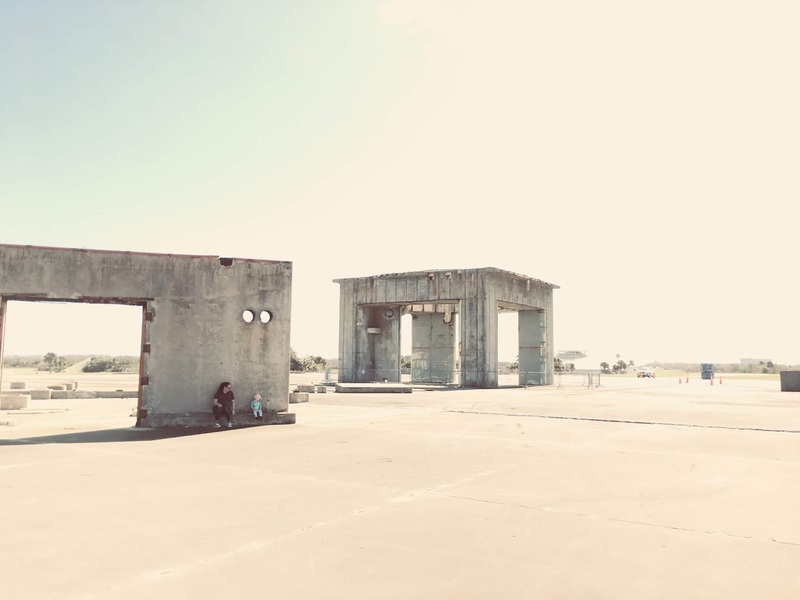 After many wrong turns and attempts to use Google Earth to determine passable roads we landed at Launch Complex 14 - the home of America's departure from Earth into orbit. The domed concrete blockhouse and dusty, disheveled road to the launchpad look frozen in time, as if John Glenn himself may be arriving in the astro-van at any moment. As we climbed the steep stairs to the top of the blockhouse I imagined the bustling activity that once occurred here. Engineers would have been in the blockhouse watching pre-flight telemetry, technicians would have been at the ready to help the astronaut into his capsule, and eager onlookers would have been lined up along the Florida coast waiting to witness history. Four of the Mercury Seven were delivered to this slice of the Florida coast and moments later left it behind - willing participants in mankind's baby steps beyond Earth's atmosphere. 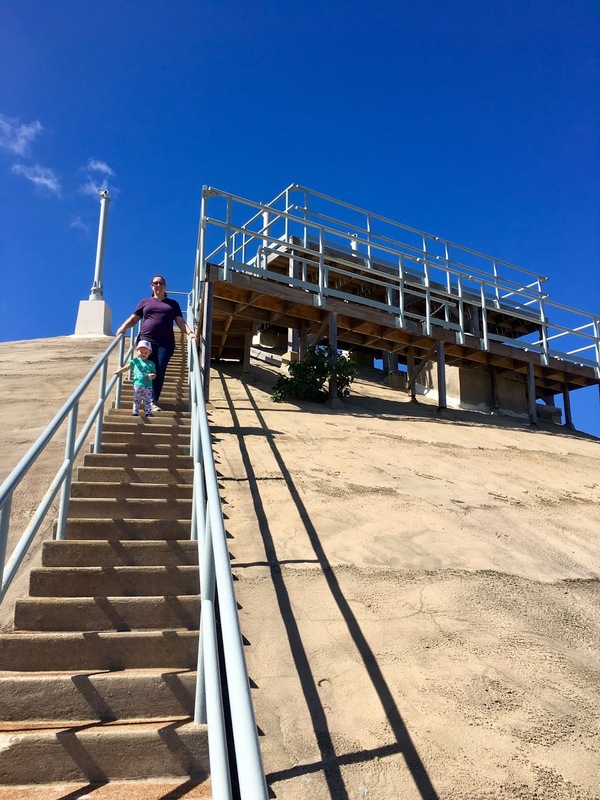 Zara and I climbing the steep stairs to the top of the blockhouse - not an easy task while 7 months pregnant! 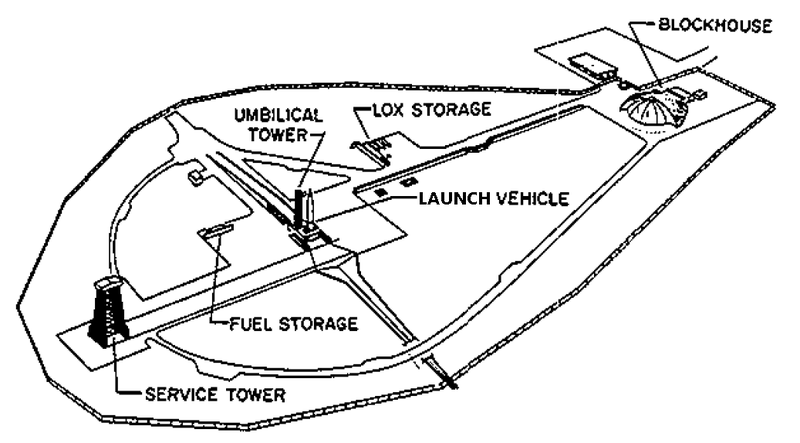 Diagram of Launch Complex 14, found here. A warm, February stroll...destination: launch pad. I had to include this photo (with photoshopped Mercury Atlas) from Jim, because he captured exactly my mind's mental photograph as we soaked in the aura of the 1960's. The last time we took the KSC tour to LC34, the stop wasn't really a stop. We sort of rolled by and the tour guide nodded in the general direction, something about it was "closed" that day. Of course I wasn't sure if this was the default configuration, considering the launchpad's history. I captured this photo the day we were there - a haunting moon looms overhead. The site marks America's first manned spaceflight tragedy - ironically, a place, firmly on Earth. During a pre-flight test something went wrong, actually lots of things went wrong. And, after it was all said and done, three American heroes lost their lives in the Apollo 1 fire. The concrete structure and rusted metal are all that remains here. 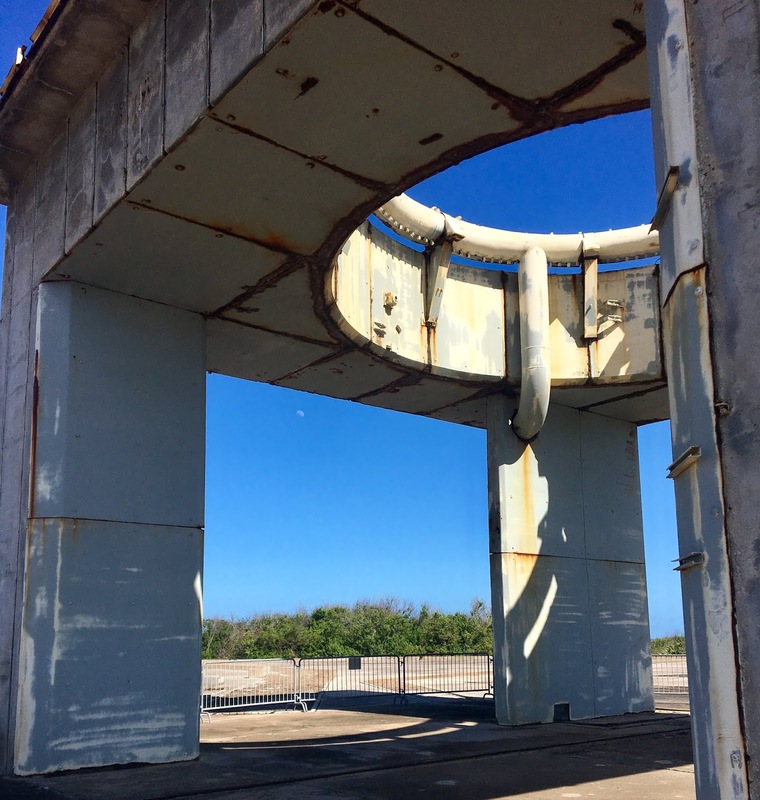 While it may be a memorial of sorts, I believe the tribute to these brave astronauts are the launch pads just down the road that are being refurbished for America's next space venture. These relics however, are a sobering reminder for all of us doing space today - there are extreme consequences to our actions, or lack thereof, and ignorance has no place here. 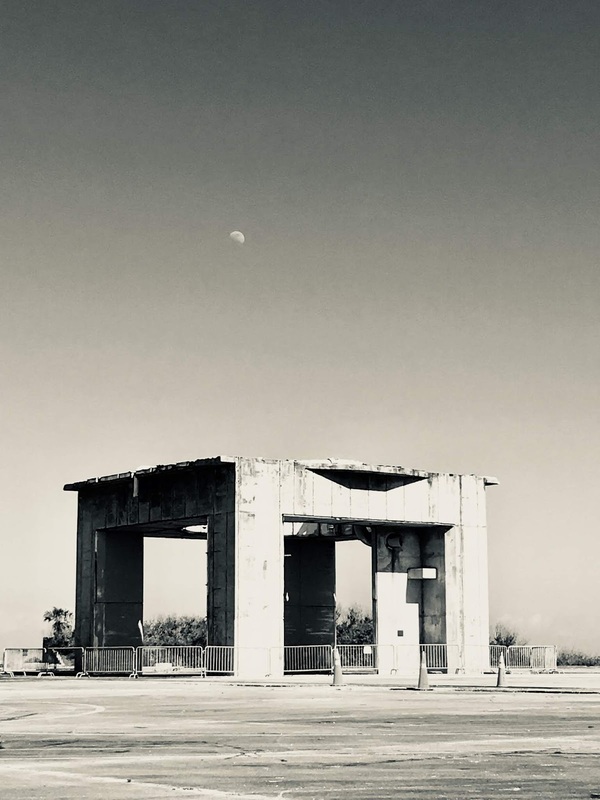 From Gateway to the Moon, "Work moved ahead rapidly on LC-34's major structures in early 1961...At the pad, four reinforced concrete columns, 7 meters high and more than 2 meters thick, stood at the corners of the 13-meter-square launch pedestal...At its formal dedication 5 June 1961, LC-34 represented the largest launch facility in the free world." Off to the west of the launch complex are the huge, steel flame deflectors, originally moved in place under the launch vehicle via a set of rails. Each flame deflector is 43 ft long, 32 ft wide and 21 ft high, weighing in at around 150 tons. If you look close, Zara is walking next to the structure in the picture above. It was a bit strange - we had the entire pad complex to ourselves while we visited. We were free to walk around, explore, contemplate and soak.it.in. 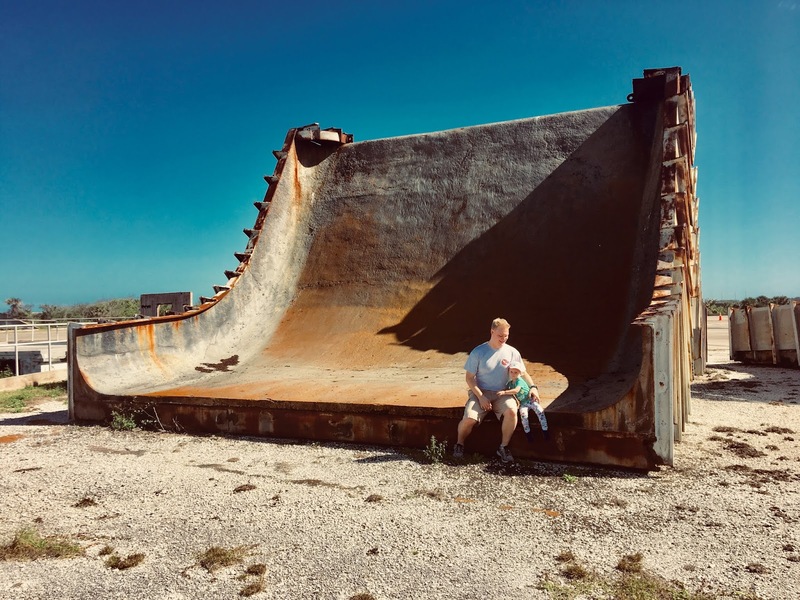 Chris and I marveled at the engineering of a launch complex and Zara was entertained by climbing on the concrete blocks - there is something for everyone, a way for everyone to interact with this special place. Zara can feel it too - there is something incredibly eerie yet serene about this place. We soak in a moment together in the shade. 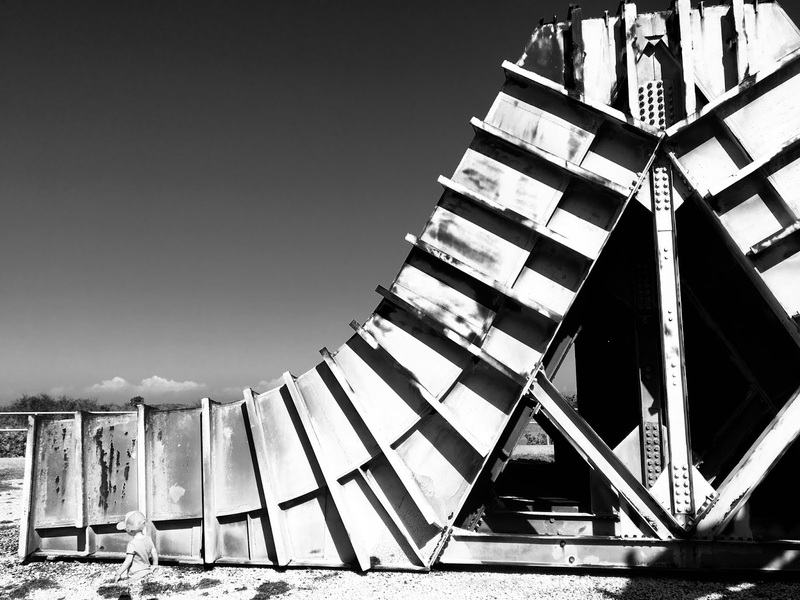 Visiting these sites, in all their abandoned glory, allows a split second of time travel. 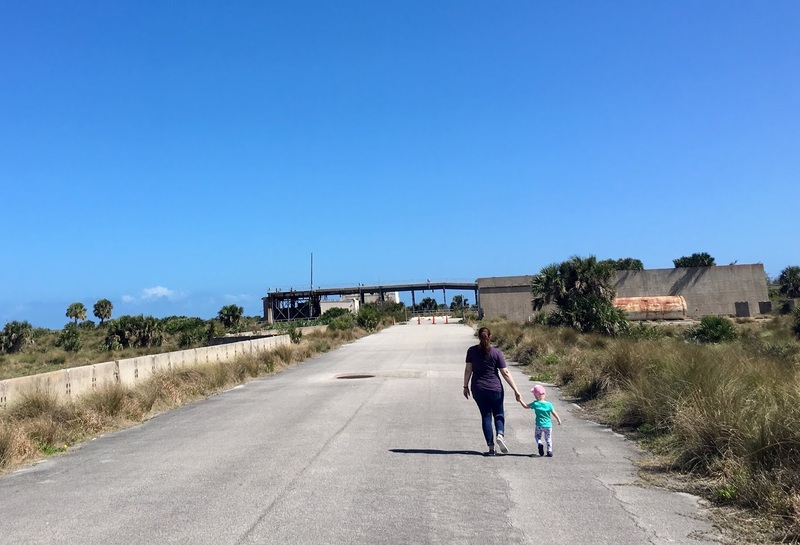 This path out to the launch pad was the same one taken by scores of manned spaceflight enthusiasts, just like me, but in moments with consequences I can only imagine. Their calculations were done by hand, each flight truly a "test" of so many moving pieces - these launchpads included. 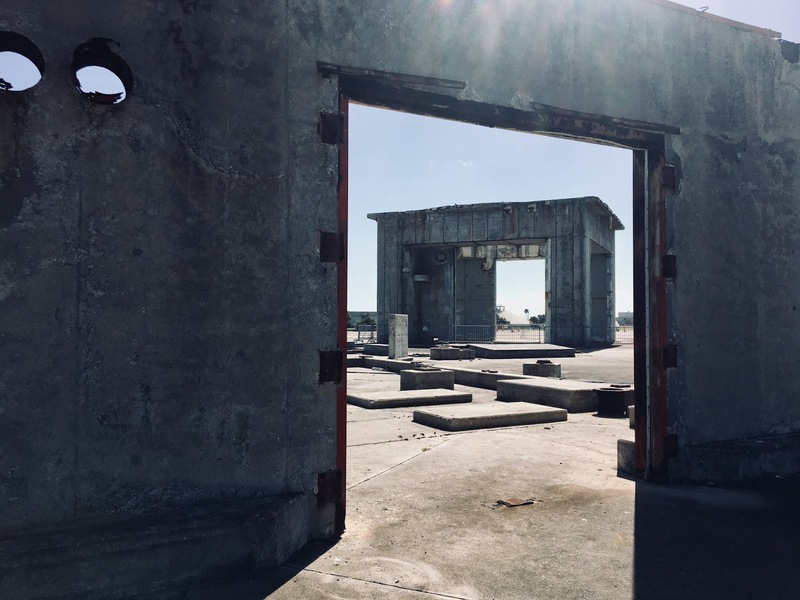 A breath of salt air causes a snap back to the rusty reality of 2018, and the decaying launch sites come back into view. I can't help but wonder what this generation's relics will be. We returned to the visitor's center in hopes to make it through the Atlantis exhibit before closing time. It is so well done, definitely a favorite stop every visit! 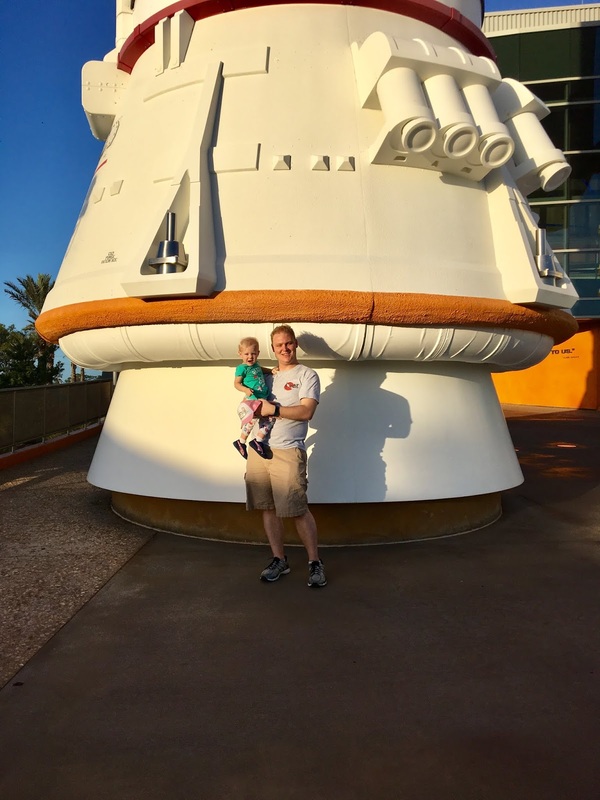 Chris and Zara smile in front of the solid rocket booster! And for those with kids, the Atlantis building has a spot to let out some energy. 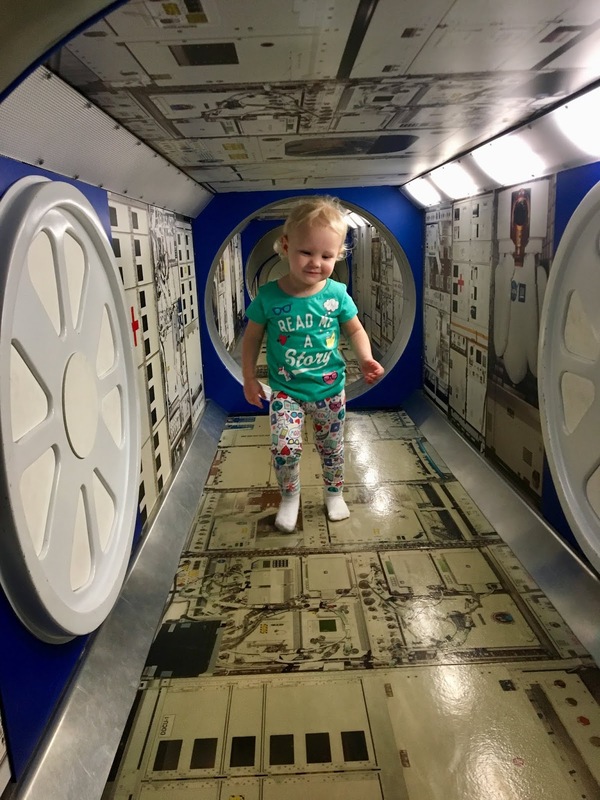 I suggest leaving one parent to watch the littles play inside the "International Space Station" while the other parent takes a quiet moment to experience the "Forever Remembered" exhibit downstairs. It may sound morbid, but it is another one of our favorite exhibits to visit. 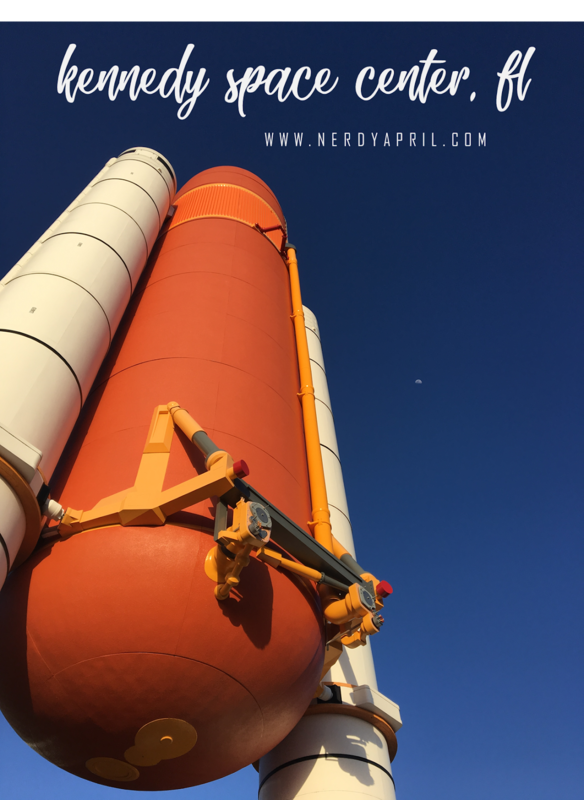 Feel free to send me an email if you have questions about visiting the Kennedy Space Center (or Space Center Houston, or Huntsville Space and Rocket Center, or countless other space museums, I've been to a ton! )!